A fictional account (though based on fact) of life in a Japanese internment camp during WW2. A fictional account (though very much based on fact) of life in a Japanese internment camp during World War Two. I first came across this book when I attended a very informative talk given by Clive Himsworth (the author) on life in Stanly Internment Camp (Hong Kong) during World War Two. Although Clive was never actually interned there, his parents were and he was born in Hong Kong 2 years after there release. He has obviously had first hand accounts of life in the camp as well as careful researching the subject. The book surprised me on two counts. I had expected the book to be a factual account and I had expected it to deal solely with life in the camp. It is however a fictional account that follows the life of the main character 'John Aldcott' from the age of 8 when he escapes from China with his missionary parents. This in no way detracts and I found that I was 'hooked' after the first chapter, finishing the book in a couple of days (unusual for me considering my busy schedule). 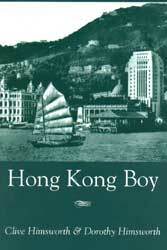 I found 'Hong Kong Boy' to be a most enjoyable book which although not covering the internment camp in extreme detail (the camp covers about one third of the book) does give a flavor of what life was like. I certainly enjoyed it and would recommend it.